Click on the image above to read the magazine online. (1) Can you tell us about yourself by introducing yourself briefly? I’m a mother of two girls whom I homeschool. Mars is 9 and Bear is almost 6. I am from Singapore and am married to a Pakistani. We have two homes – one in Singapore and one in Islamabad, Pakistan. We live mostly in Islamabad though and visit my family in Singapore twice a year. (2) What are the reasons that pushed you to live in Pakistan? And why this particular country? When I married my husband, he was then completing his studies in Indiana, USA so I joined him there. After 6 months, we moved to Wisconsin, where he was offered a job. I don’t think we had planned to live in the US permanently – we didn’t have concrete plans to be honest – but we did plan to be there for a while as my husband wanted to get work experience. In addition, his sister was planning to pursue her studies there, so he felt it was important for him to remain in the US as her mahram. I was initially happy – I’d always wanted to see more of the world and meet people from all walks of life. Being married to a foreigner based in a foreign country was a dream come true. However, there were other issues and these often caused us worry and to feel torn. My father had been diagnosed with cancer just a few months before our wedding and even though he was in remission, we wished we could be of better support to him. My parents-in-law were also missing their sons – both my husband and his brother had been studying and working overseas for some 6 years. My husband often wondered if he could better serve his parents back home. When I was later expecting our first child, we began to have more doubts. Even though we had found good Muslim company, we felt it was not enough. We had no extended family there unlike in Singapore and Pakistan. It wasn’t uncommon for folks to move and we often made good friends only to lose them when they relocated for a better job or returned to their home country. Even we weren’t planning to stay there for the long haul so we always felt unconnected and unrooted, which would have been fine and even fun if we didn’t have children or familial obligations to consider. It all made me feel that the Muslims’ position in the US would always be ‘precarious’ and it wasn’t something I had to stand for or something I wanted for my children. We decided to move either to Singapore (even though it isn’t a Muslim country, we have family and therefore support there) or Pakistan. Alhamdulillah there was a job opening in Singapore. I thank Allah for the decision we made (or for making the decision for us!) – we returned to Singapore with my then 3-month old daughter and she made my father so very happy. I remember a relative saying that Mars gave my father the courage to fight his cancer harder. We had initially worried about finances but alhamdulillah, we always had savings at the end of every month. I believe Allah gave us this assistance as we made a decision that was pleasing to Him. What made me happiest was the fact that we were able to spend my father’s last moments with him. He survived another 11 months and I am so glad that Allah allowed us the opportunity to spend so much time with him before he passed on. Shortly after my father’s death, my in-laws needed my husband’s presence and so he made the decision to move. I will be honest when I say I was very much against it. I had grown used to the many conveniences in Singapore – excellent public transport, facilities, places of interest and so on – so I really railed against the move. I did make peace with this decision when I saw that I was being selfish. My husband had stood by my family and I knew I had to do the same for his. So we moved to Pakistan in 2004 and lived there for 3 years. We moved back to Singapore for 2 years while my husband set up a business (his brother returned from the US to Pakistan to take care of my in-laws at that time). In 2008, we moved back to Pakistan where we have been since. Alhamdulillah here, my husband’s business has a great deal of potential for development and growth and has been doing well. I could say that we moved to Pakistan due to family obligations, but it isn’t the whole truth. I could also say that we moved to Pakistan because my husband has better business prospects here, but it isn’t the complete truth either. We are here because Allah made the choice easy for us – alhamdulillah being in Pakistan has been really good for our family, our livelihood and most of all, our deen. It was not something I had expected but it has been a wonderful surprise. (3) What was it like in the beginning? When we first moved to Pakistan in 2004, it was difficult for my mother. She was close to Mars and was sad to be separated from her. Still, she came round and understood how my in-laws needed their son and she also understood that as a wife I had to stand by my husband. I am very close to my relatives as well and while they were sad that we had to move, they supported us and welcome us warmly whenever we visited. It was a little difficult for me in the beginning. I wasn’t used to the way things are done here in Pakistan. Singapore’s public transport is excellent so I never needed to learn how to drive. It isn’t so in Pakistan, so I was more home-bound, which really didn’t sit well wtih me. I couldn’t go out whenever I pleased as it wasn’t safe for me to take the taxis. It often frustrated me that I had to wait for help before I could get things done. As for my husband, he had left Pakistan when he was 17. The country had changed a great deal by the time he returned as a working adult. He had to deal with corruption and dishonesty and this left him so disillusioned that he confided in me once that he wished he could go back to Singapore. Mars was just two (and then an only child) when we moved but ma shaa Allah, she took it like a real trouper. She has always been mature for her age alhamdulillah. While Pakistan is a big switch from the more modern and developed Singapore, she adjusted well. I think it has to do with the fact that we had always kept our own lives simple no matter where we lived. I remember once when we experienced the first of many power outages. (This is called load shedding and it happens frequently in summers in Pakistan.) It was night then and inwardly, I thought, “Oh dear…” but my daughter ran outside to the driveway and said excitedly, “Look Ummi! Look! Look at how bright the moon is!” She was not thinking about how inconvenient it was to lose the power and be in the dark. She was not thinking about how horribly inefficient things can be in Pakistan. She was not thinking about how much easier it could have been had we still been in Singapore. She was just looking at the bright side of things and I knew then that if she could be positive, then so could I. Both my husband found it hard being in Pakistan but we reiterated many times that we moved to please Allah and that He would help us. Alhamdulillah, in trying to encourage our daughter, we found comfort and ease in those words. In the beginning, as I said, it was a little difficult for us. I found the days horribly tedious as I had little to do and nowhere to go. Mars and I were also an oddity – NO ONE we knew in Pakistan was homeschooling then and it was honestly no fun being the town freak. I loved being with my daughter and learning with her, but sometimes the endless comments and questions made me feel very much alone and anxious. It felt like our every move was being scrutinised and my daughter’s every progress monitored. It was as if I had to pass some benchmark in order to justify homeschooling. Still we pushed on. We were not short of learning materials alhamdulillah. Islamabad has numerous second-hand bookstores (I think I’ve raved about these quite a bit on my blog!) and we would buy books by the bag. When we visited Singapore, we would buy whatever we could not find here in Islamabad. The one downer was that Mars didn’t have friends. The cousins who were her age (aged 2 to 4) couldn’t communicate well with her as they had not learnt sufficient English in school yet and the older ones who could, weren’t interested in playing with a little kid. I tried to find some friends initially. Maybe I had unrealistic expectations, but a few folks put me off this effort. Some parents would promise to call and arrange playdates, but these never materialised. One mum kept telling my mother-in-law that she wanted to get together with me, but everytime we did, she would ask for children’s learning materials and proceed to converse only with my mother-in-law totally in Urdu. This actually went on for a while until she eventually just dropped asking to meet me and would ask my mother-in-law for videos and books. When I told my mother-in-law (pleasantly) that she could ask me herself, I never heard from her. This and other annoying encounters led me to simply make du`aa for the right friends and alhamdulillah, Allah answered my prayers. We met a lovely English lady, Maria, who had 3 wonderful children – her eldest daughter who was 9 was so sweet and would play with Mars. The age difference didn’t matter an ounce to her. The family moved later on and it just about broke Mars’ heart. Mars loves Bee to this day and counts her as her very best friend. Our families have kept in touch long distance and have had a reunion as well, with another one in store in shaa Allah … our unique background and situation have given us unique friendships as well alhamdulillah. We’ve also started a humble library/resource centre alhamdulillah. I’m an unrepentant bibliomaniac (just in case you didn’t know that already, hehe…) and it looks like I’ve passed the gene on to my kids. We hate returning library books – we feel oddly possessive over them and get upset when something has been checked out (“Who took our book! ?”) – and can’t bear to sell our old books so we thought we’d put this obsession to good use and open our own library! Alhamdulillah we have a few families coming over (yay! playdates!) to borrow our books and we are looking to expand our shelves in shaa Allah. There are people who admire us for living in Pakistan (“you must be really patient to be able to bear it!”) and there are people who feel sorry for us (“Oh! You must visit our country… there is so much to do and your kids will love it too!”). I find this sort of attitude really condescending and annoying. While Pakistan isn’t the easiest place to live in, I really believe it isn’t bad at all. In fact, I am glad that we live here because it is a more ‘real’ place to be. For all of Singapore’s positives, I still believe that Pakistan has been better for us. It isn’t wrong to wish for an easy life of course – no one wishes undue trial upon themselves. However, it is, I believe, easy to forget the akhirah in a place like Singapore. Life can be so comfortable that you forget that life isn’t about seeking comfort and ease for this world. Feeling too safe makes you afraid to venture out and sacrifice. It makes you forget how other people have it so much worse because even though there are disadvantaged people in Singapore, their hardships don’t quite compare to those of people in truly poor countries. In Pakistan, we have seen people who do not even have a roof over their heads… people who were forced to send their children out to beg just so they had something to fill their stomachs for the day. Seeing people like these reminds us that we not only have a lot to be thankful for, but also that we have a lot of work to do to make the world a better place for the sake of Allah. I really believe that if were to live in Singapore, we would not have the same feeling of empathy or urgency. I think life in Pakistan can be nice if you have the right attitude. Once again, I’d like to stress that it can be trying if you wish for a first-world country lifestyle. However, Pakistan has its own charms and if you embrace change positively, then life here can be very pleasant. I live in Islamabad and like it here – it isn’t as crowded as cities like Karachi and Lahore. With regards to food, the fruits, vegetables and meats are quite delicious… they don’t look as perfect as the ones you get in more developed countries. The fruits and vegetables are smaller and look a little burised. The chickens look a bit scrawny. (No, really! Don’t laugh!) However, they are much more flavourful probably because they are less chemically altered. Locally produced food is affordable – if you go to the weekend markets, you can buy them in bulk at cheaper prices. You can get foreign ingredients but these can be a little pricey. Some foods are available seasonally only so you have to get used to this. In the more developed countries you get anything you want at any time of the year because of large imports but here, it is a different story! I once wanted mangoes, but was told I had to wait for the summer and another time wanted broccoli for fried rice, but had to wait for winter. LOL! It’s a small inconvenience though and it has taught us patience. It is also fun waiting for the seasons and the special things they bring. 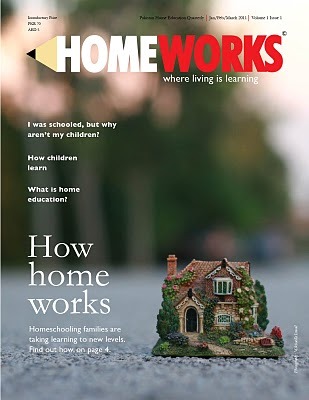 As to education, I have to say that homeschool has gotten easier for me over the years. There are Arabic courses that are of high calibre ma shaa Allah – my elder daughter attends an Arabic Institute and I take one run by another. Both have been very beneficial. Adults and teens can also take Islamic courses run by Al-Huda. We’ve also been fortunate enough to be introduced to a riding club – this is such an expensive sport in Singapore that I couldn’t get past dreaming about it for my kids. It isn’t cheap here but it is something that my kids can indulge in once in a while. They’ve also been able to take up karate and their instructors have been so patient and nurturing that they can’t bear to miss even a single class. At the end of the day, I feel blessed to be able to call two countries home. As much as I love and miss the place where I was born, I believe, there is a purpose to me being here in Pakistan. I think we have a bit of bear in us :) Now that winter is approaching here in Isloo, we seem to be preparing for hibernation by eating more! I really love looking for food and haunts new and novel. Sometimes one finds the most delightful treats in the most obscure places. Take Jumah Bazar. I would associate it with food supplies, bargain finds and snacks in the way of assorted nuts and crisps, fritters dunked in heavy syrup and other deep fried treats. It isn’t a place you would associate with sophisticated fare, so I was more than pleasantly surprised to find these delicate morsels subtly flavoured with sugar and rose. My husband chanced upon an Irani man named Saeed who had a little stall at the weekend farmers’ market. He had an interesting array of treats like apple and carrot jam (more on that later! ), flower-shaped sweet crackers and those delicious sweetmeats pictured above called bamya (or okra because of the shape). 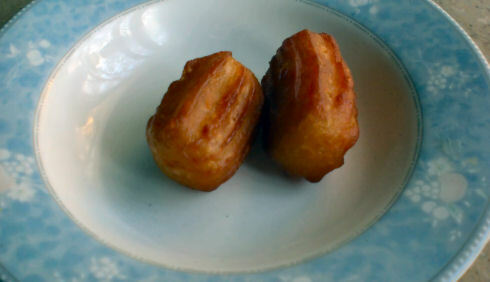 There were a dozen bamya in the box. Only those two were left by the time I remembered to take some shots. I’m not a fan of sweets, but they were really sinfully irresistible ma shaa Allah. There aren’t many things I like about winter to be honest. I detest the piles of winter wear and extra bedclothes that clutter up the rooms and most of all, I dread how the cold weather reduces me to a wheezing and coughing wretch. (I have adult-onset asthma.) I am a tropical person, so give me heat and humidity ANY day. Having said that, one must count one’s blessings and I must admit that Pakistan’s winters have a lot to offer in terms of gastronomic pleasures. We get sweet kinoo (oranges) in winter. Soups and teas taste infinitely better when it is cold outside as well. I am also looking forward to my mother-in-law’s famous gorgeous pink tea! Yesterday, the girls and I worked on lunch together. 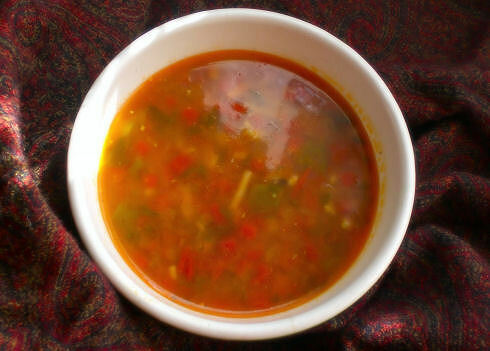 We made a soup whose recipe came from their sweet aunt, Lamiya, who is from Azerbaijan. It is a hit in our home because it is quite easy to make and is so chock full of goodness that it is a meal all on its own. It does involve a fair bit of ingredients and preparation but maybe that is why the girls love it so – we share a lot of laughs while cooking together. Tomatoes, about 8 – chopped, the more the merrier! 1. Place chicken stock ingredients in a large pot. Bring to boil and then simmer over low heat for an hour or so. Remove chicken and shred/chop meat into small cubes. Set meat aside. 2. Saute onions and then garlic in a separate pot. Add chilli powder and turmeric powder and fry for a minute or so. Add tomatoes and cook till softened. Add capsicums and cook till tomatoes have broken down, adding water/stock to make sure mixture doesn’t stick to the pan. Add carrots and potatoes and stir. 3. Place a sieve/colander over the pot. Pour chicken stock through the sieve into the tomato mixture and discard bones/onion/garlic. Bring to a boil and add chopped chicken and noodles. When noodles are cooked through, add chopped coriander and cook another 5 minutes. Season with salt and freshly ground black pepper. If you don’t like the soup too sour, you can add a little sugar. 4. Serve piping hot with crusty bread or Tendir Choreyi. 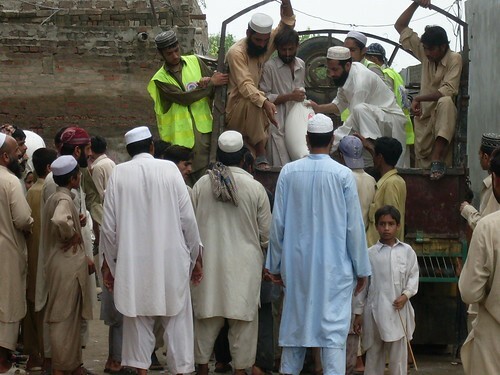 By the Grace of Allah subhana hu wa ta`ala we (Tahir Farouqi, Ali Raza and Danish Qaiyoum) returned from Charsadda villages after successfully completing the first round of relief efforts in the flood hit areas. We got to witness pain, anguish, disaster, hunger, misery, violence and above all, Allah’s anger in the form of rivers flowing way out of control. I simply go out of words when trying to express the feeling. This email contains some details which will give the reader a basic idea about how we drove the overall effort. May Allah accept this little effort and contributions from everyone who stepped forward. What were our areas of focus? Our main camp of ‘Hunermand Pakistan’ was based in NavaKilla Charsadda. Navakilla is a village which is about 4-6 km away from main Charsadda City Adda. This small town is surrounded by many other small villages. 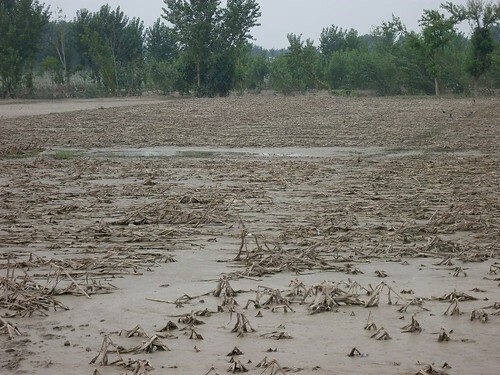 River Kabul and River Sawat flowed across these areas which caused massive destruction. Our main focus remained on these 12 small villages around NavaKilla which were shattered by the flood. Little relief efforts came to these places since accessibility to these areas was tough. Alhamdulillah we were able to gain access to these areas. 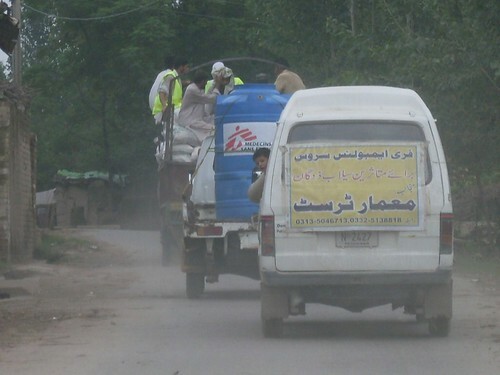 We have been also coordinating with our friend’s/relief workers in Bisham of District Shangla. Let me tell you that Shangla has the lowest Human Development Index in the province and second lowest in the country! 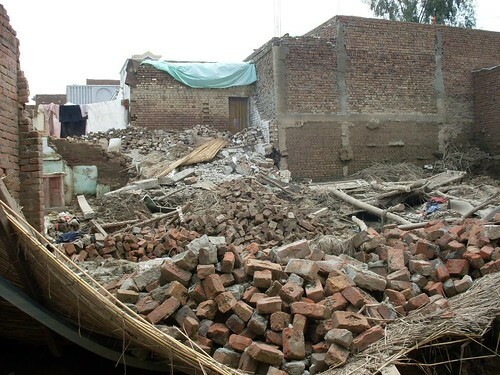 Hundred of families have been badly affected by the flood, land sliding followed by heavy rain in the surroundings of Shangla were also witnessed. What was the destruction like? As I mentioned before, no words can express. You should have been with me to feel the pain and misery that these people were going through. Broken bridges, destructed houses, tearful eyes silently communicated the message “We have lost everything but hope.” “Who will help us now?” Attached with this email, you can find images which can give you a little idea about the destruction we witnessed. I have added short description next to each image. Shortly I will be releasing a full youtube video that we made which will give you a more clearer picture about what was going on. The situation in remote areas of Bisham is quite different to other flood hit areas. There is no road access to the remote areas of Shangla, as all the connecting bridges have been broken. I will be sharing pictures of that area as soon as we get them inshAllah. What did we do to help these shattered souls? What was the process that we executed during this relief effort? 1. Formation of flood impact survey teams and assignment of these teams to different villages. 2. Collection of information with respect to flood impact caused to each home in these villages. 3. 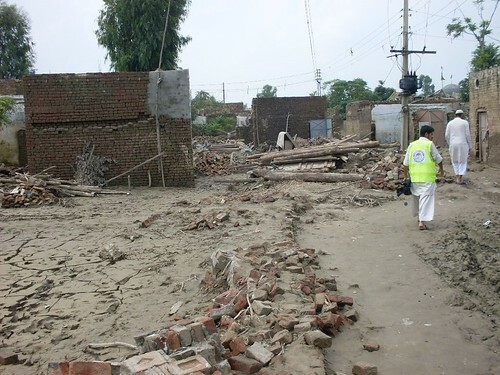 Dissemination of flood impact information to brothers and sisters across Pakistan who then came to help. This information contained details about immediate bare minimum needs of the victims which were required for their survival. 5. 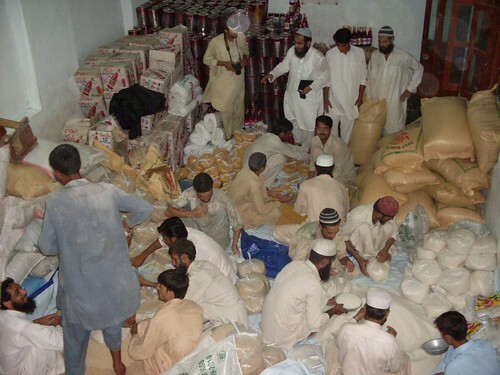 Devising the relief packages, purchasing food supplies and conversion of supplies into well defined packages. 6. Distribution of Ramadan food Package to flood hit families. 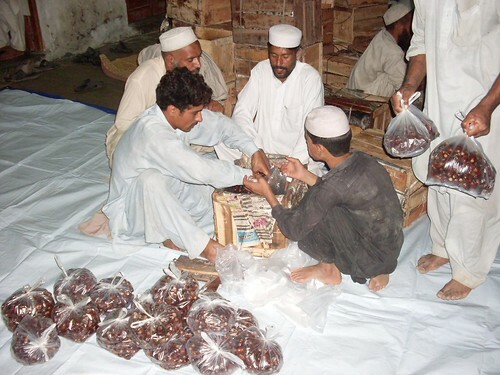 The distribution process in Shangla is slightly different as there is no road access to that area. Mules are being hired for the distribution of the food supplies. JazakAllahukhair for all your prayers and support! These were 5 small houses in the village of Rajjar. Can you find them? This was the street which had houses on both sides. Another view of a street in a village of Charsadda. 12 feet water stood here for more than 7 days. 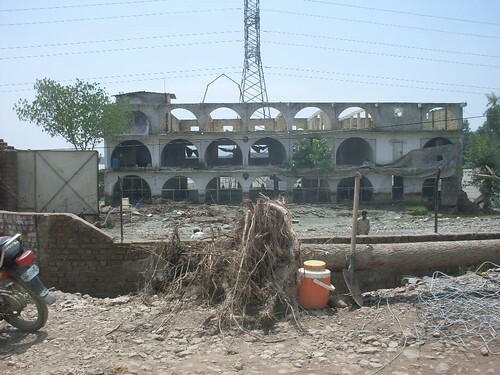 A 3-storey school on main GT road which was fully submerged in water for a few days. An iron bridge on main GT road. 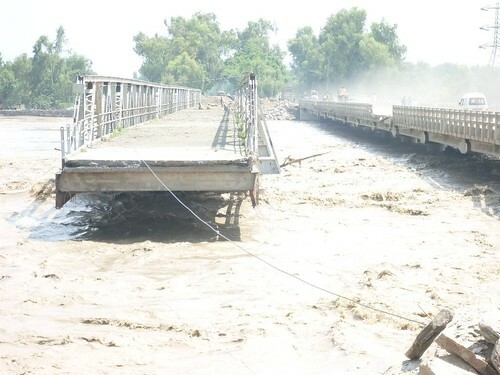 This bridge was fully covered with water and was finally swept away. We provided relief efforts just few kms away from this location. 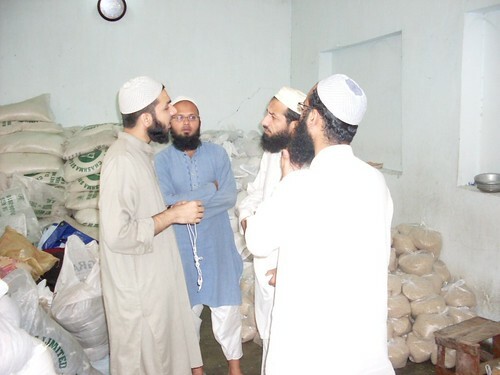 From left to right Ali, Danish, Dr Abdullah and Tahir discussing the distribution process in our storage room. Our storage room: We spent the night converting supplies into separate bags for Ramadan Packages. More than 50 people worked all night long to perform this job. 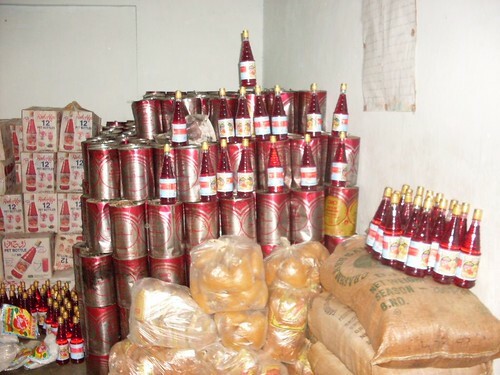 A view of our storage room after the food supplies were converted to separate Ramadan Package (Bags). Our food supplies kept on coming in finding its way in the storage room and then finally landing in the hands of deserving flood victims. In view of the upcoming Ramadan we added 1kg of dates to each Ramadan package. The team is working in full swing at night time in order to meet their deadline. One of our loaded mini trucks is moving ahead while our distribution staff is using a van from Maymar Trust. Distribution taking place in one of the affected villages. 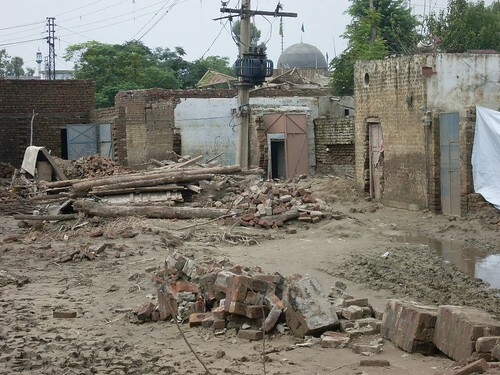 Around 1,000 houses were destroyed in this small village called Rajjar.